If the free web-based encyclopedia has always been your favorite site when you search for information or data, then the free software extension to your Firefox browser, Googlepedia, could be something that can make the searching process more efficient. 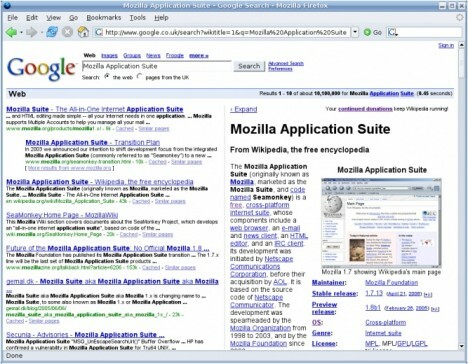 With Googlepedia add-on installed to your Firefox browser, when users make some searches via the Google search engine, users will see the main page on the browser split into two sides. The left side will show users the regular web results, whereas the right side will present users with relevant Wikipedia articles based on Google search engine’s top results. With Googlepedia, users can kill two birds with one stone. Users can get the search results from both Google and Wikipedia at the same time. Of course users can freely expand each side to its full sized version if they want to. The program also allows users to disable Googlepedia if they don’t require search results from Wikipedia. Interface translated into 7 languages – Chinese, German, Japanese, Polish, Czech, Dutch and Portuguese.